I love this ingredient and bought mine in Espelette when on holiday. Its a fascinating place with large bunches of peppers hanging out to dry outside the houses – do go if you can! I remember sampling some expensive and amazing chilli flavoured chocolate. I’m always looking for new ways to use my Espelette pepper, so thanks! Thanks – it’s an interesting spice. Not too hot, a bit like paprika with a bit of punch. I got mine from a friend come comes from that part of France, and my jar is very nearly finished. 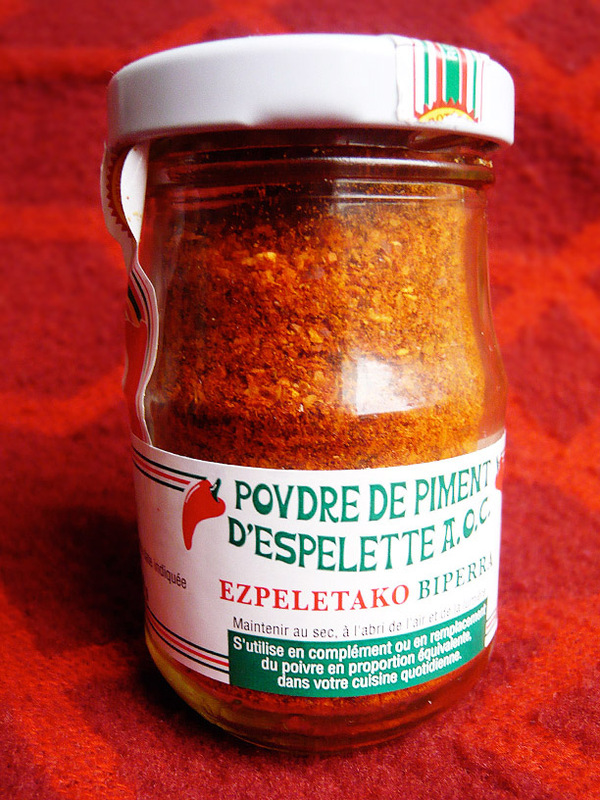 Have you got any favourite uses for piment d’espelette? but I hope to rectify this very soon. It would certainly be the pepper I would try it if I was making a chocolate cake with chilli, if only for the memory of our holiday! Ha! That’s exactly how I use it in cooking as well! In fact, whenever I make a basic tomato sauce for pasta, I add a teaspoon of piment d’espelette, so you have the warmth but not too hot. I did try making a chocolate tart with piment and white chocolate. It was good, but I think it might be even better with dark chocolate – I must revisit that and report back.